One of the more crazy types of pets I've had in the past were peafowl. For some reason most people act like they don't know what peafowl are when I know that they do. You know what a peacock is, right? Well a peacock is a boy peafowl. A peahen is a gal peafowl, and they are not nearly as pretty. Now you know. 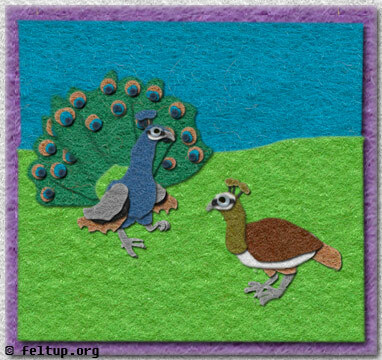 I have many a wacky peafowl story, but I shall tell one of the sillier ones. Peafowl make several types of noises, one is sort of like a clucking noise, another is a honking sound, like that of a goose, and the third is a really loud cry that sounds like some one yelling for help. It gets used a lot as a sound clip for movies and TV shows when folks are in a jungle, it seems. Some peahen must have heard my peafowl making their wacky jungle call, because one day she came flying in out of no where (yes, peafowl fly). Since peafowl aren't exactly native to New York state and turkeys, which a layperson could a mistake a peahen for.. and shoot at it are, I decided that the peahen would probably be safer is she joined my flock. The problem was, she was up a tree. So I chopped the tree down and caught her with a net. An attempt to find her previous owner did not succeed. She was a bit browner than my other peahens, so I named her Potato.